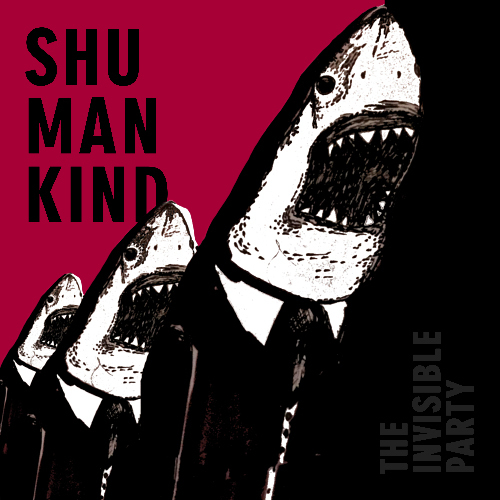 Shumankind is the debut record by The Invisible Party, an improvising trio that plays hard and takes no prisoners. The three-pronged attack of guitar, bass and drums creates splatters of spontaneity, off-kilter phrases and distorted shrieks and scrapes, all done with merciless joy and abandon. Shumankind rewards repeated listening as new shapes and colors take form to reveal a truly one-of-a-kind musical universe. Guitarist Jon Lipscomb is based in Malmö, Sweden and has worked with Brandon Lopez, Jarrett Gilgore, Anders Lindsjö, Ole Mofjell, Jaimie Branch and others. Brooklyn-based bassist Kurt Kotheimer has worked with Bobby Previte, Chris Cohen (Deerhoof), Michael Coleman (Michael Rocketship), Ava Mendoza, Matt Nelson (Tune-Yards) and others. Also based in Brooklyn, drummer and multi-instrumentalist Dave Treut has worked with Crystal Fighters, Kaki King, Chris Taylor (Grizzlybear), Wild Yaks, Brandon Seabrook and others. Engineered and mixed by Kurt Kotheimer at Figure 8 in Brooklyn, NY summer of 2017.